The DC motor is on the left and the motor controller is on the right with the main contactor is in front of it. The ammeter shunt is to the left of the contactor. An acrylic sheet protects the contactor and the terminals of the controller from water.. 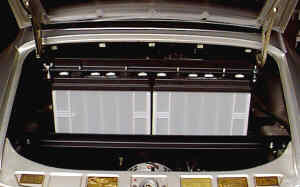 The negative power cable (size 2/0) enters at the right front corner of the compartment. The pot-box/relay assembly is at the top of the picture. 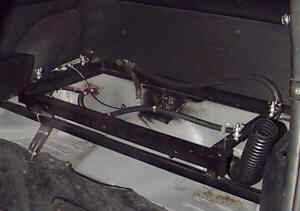 The throttle cable (from an '88 Dodge van) connects to the pot-box from the left. The pot-box, which controls the motor speed, is in the center and the two control relays are on the right. The cable and connector (left, front) are the original engine compartment wiring now used somewhat differently than Porsche planned. 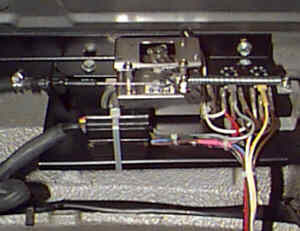 The auxilliary throttle spring is at the right, in front of the relays. The rack is powder coated. A very nice finish but expensive. The 50-150 volts gauge (left) and the 0-400 amps ammeter.The red LED's above the ammeter replace the hand brake/seat belt and alternator warning lights. The alternator light is actuated now by the motor's high temperature sensor. 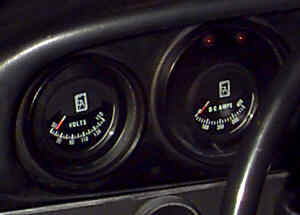 The new gauges were installed inside the shells of the original Porsche gauges. 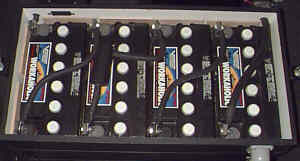 The battery box is at the front. 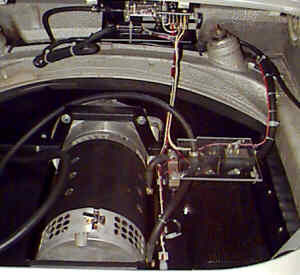 A not visible vertically mounted biscuit fan attached to the rear (upper left) of the battery box runs during charging to vent noxious gases outside the car via the fitting and hose at the front (lower right) of the battery box. Above is the line booster, battery charger, 250 amp motor circuit breaker and the DC-DC converter (which supplies 12 volts to the car from the main batteries).. 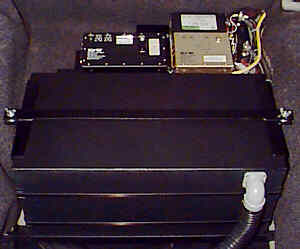 The line booster is at the lower right with the charger to the left. Above is the DC-DC converter. To the right, is the circuit breaker. The interlock relay (disables the car during charging) is to the left of the breaker. The power goes in here! 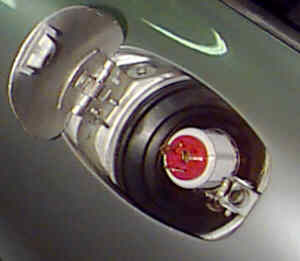 As is de rigueur amongst the EV crowd, the battery charger power connector replaces the fuel filler cap. The rack is mounted above the rear seats over the transmission hump. 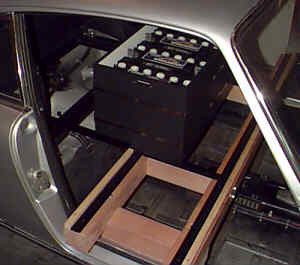 The batteries are loaded into the rear battery box outside the car and the battery box is slid into place by means of the rear battery loader. The rear battery loader in action with a full box of batteries on its way into the rear battery rack. The sliding surfaces steel covered with Teflon® tape. The loader is made mostly out of clear fir 4 by 4's and is attached to the battery rack with an angle iron frame. The L-shaped cable atop the second battery from the left contains a fusible link which is hidden by its protective cover (the black blob). This routing permits easy access the the battery filler caps. The batteries in the rear box are wired the same. 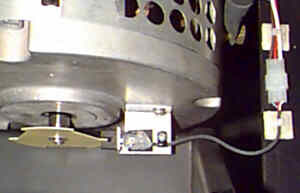 The yellow plastic card attached to the motor shaft interrupts a beam of light across a sensor gap (left, center) three times per revolution. A little bit of electronics (right, center) conditions the sensor output into a signal that can operate the tachometer.